Our summer adventures continued in Bali, Indonesia - the only predominantly Hindu island in the country. It was our first experience with this fascinating religion. 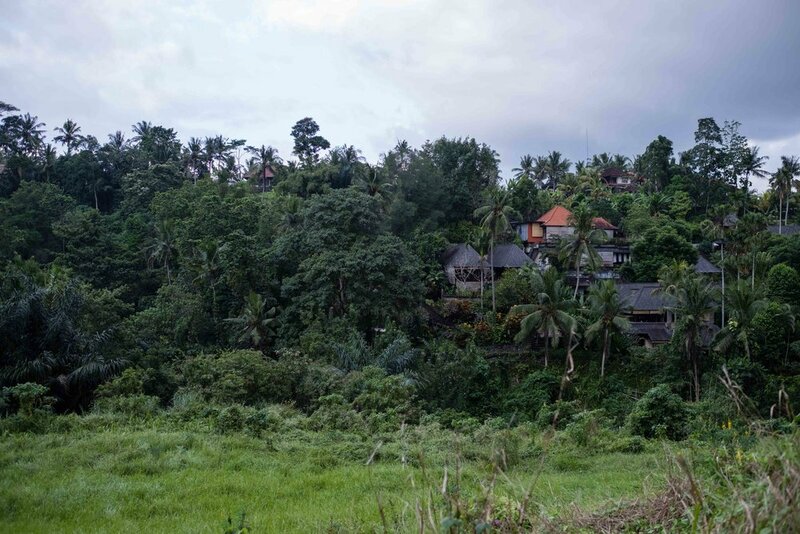 Our first stay was a private inexpensive villa outside Ubud centre. 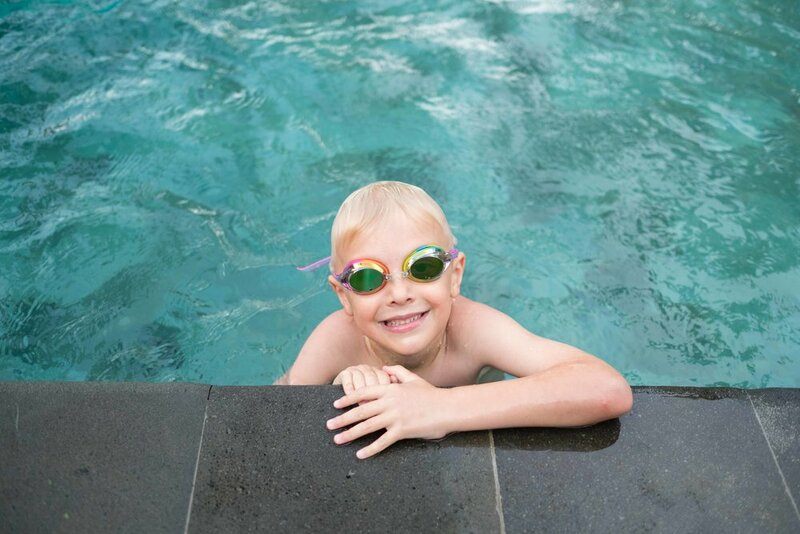 We had our own pool near the rice terraces, which are owned by the family running the villa. Be Bali Stay was gorgeous inside and out with hand carved Balinese and Javanese woodwork. 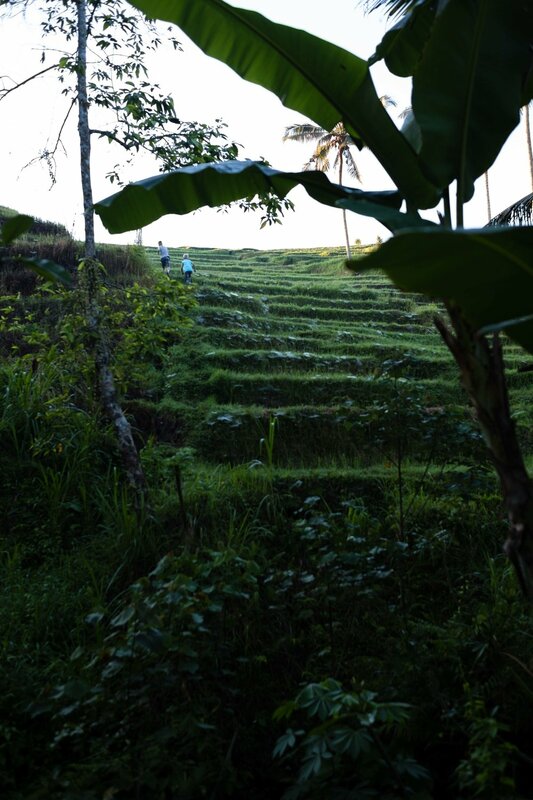 From our deck we could watch the monkeys, monitor lizards, and farmers go about their day on the terraces. The family, headed by Kadek and Made, took care of our every need, from laundry to massage to pizzas and breakfast. This is where I developed my new passion for fresh mango in the morning. It was one of the most scenic and relaxing places I've ever stayed, second only to Casa Colinas in Andalusia and our lodge in Belize. Our first morning we followed the sun up to the rice fields to explore. These fields are owned by Kadek's family. Each trough holds about 5-6 inches of muddy water. The rice had just been harvested and burned, so we saw mostly brown stumps and some new plantings. 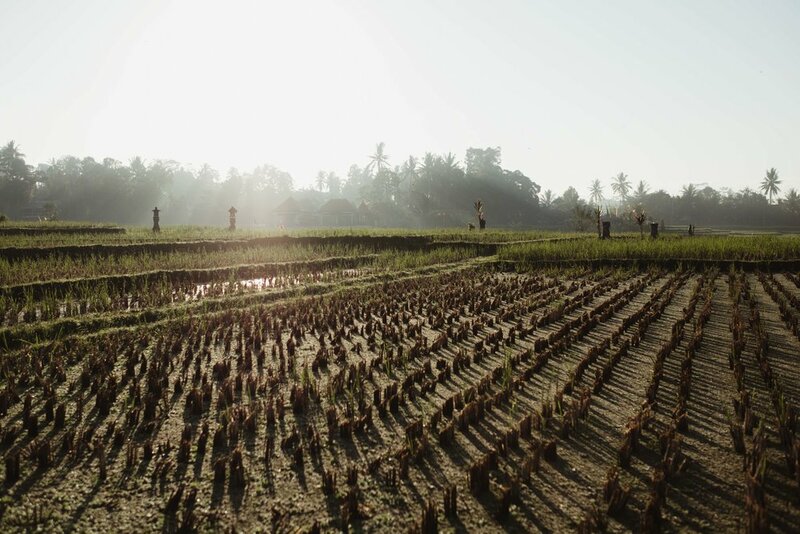 Thanks to genetic engineering, Balinese farmers can harvest this type of rice every 3 months. It was treacherous footing and I slipped in the mud several times. Ducks waddled by in a panic, acting like they've never seen a human before. Kadek was our driver when we headed in to the grocery store and to Bali Safari to see some more wildlife. We saw Komodo dragons (from nearby Komodo Island), white tigers, and real live piranhas (not native to Indonesia)! There used to be a small species of tiger here on Bali but it was hunted to extinction. All over, on the sidewalks, in front of every building and even around our villa, were small offerings left every morning to Hindu gods for daily blessings. We had to watch our step so we didn't crush them. Eventually the offerings are eaten by the many monkeys and stray dogs around, and the leaves and petals are brushed into the drains. An ironic end for hopes and dreams? 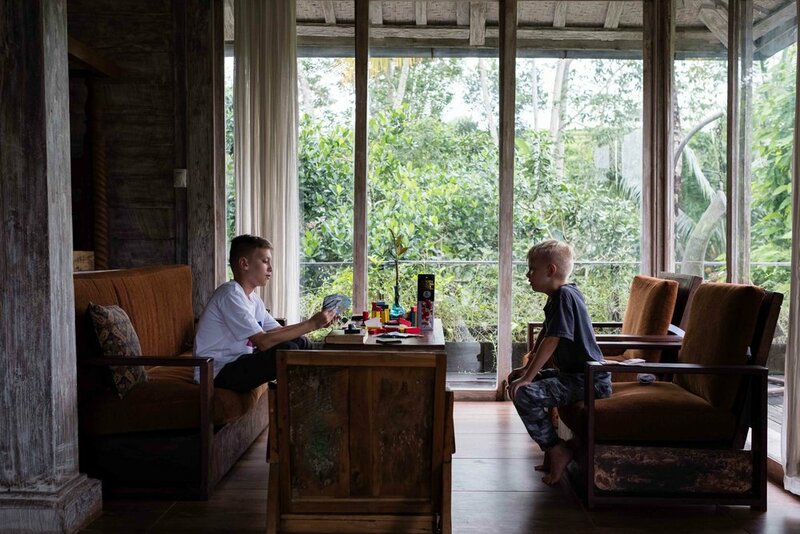 We could have, and should have, stayed here the whole time but we did want to experience Ubud centre, so after several nights the kids and I reluctantly said goodbye to Made, and her niece and nephew in their home, to move in closer to Ubud. Origin Ubud was a modern and luxurious hotel with friendly service, but less personal and homey feeling. I prefer to stay in home-like villas when possible so highly recommend Be Bali Stay. One thing we noticed over and over is the upscale aesthetic at restaurants and hotels. Many places, though basic, look like they came off the cover of a magazine spread. 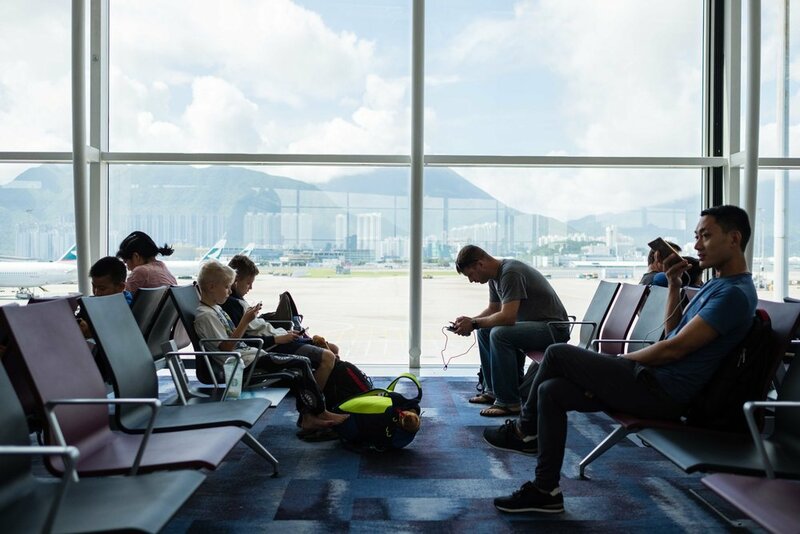 Though a poor country, the tourist areas are beautiful and well-designed, with expensive carved woods, hammered tubs, rich furniture and paintings galore - rustic but industrial chic has arrived in Bali (or maybe came from there). Craftsmanship, in everything from baskets to silver to stone is second to none. Each village has it's specialty and it's handed down from generation to generation. Mark finally joined us here in time for some white water rafting, shopping in the markets, and a Balinese cultural show with music (best described as a cacophony of sound) and typical Balinese dance, which is VERY slow and carefully timed, even down to the eye movements! We enjoyed the pool at the hotel too, and visiting various temples like Tirtu Empul. We all had to wear saris and sarongs to be admitted. This site has been a holy spring since 962 AD. We also visited one on the lake. The earth and water are central to the Hindu religion and festivals. Our last couple days were spent exploring. Mark and Reis went 4-wheeling and Knox and I walked the Campuhan Ridge Walk. We visited shops and examined the fine craftsmanship in silver, basketweaving, stone and wood carvings (each village has a craft specialty and there is an annual island-wide craft festival every year to celebrate this workmanship). Our last stop was the Monkey Sanctuary - a temple that houses and protects a large extended family of monkeys. I was a bit nervous because we've heard they can be aggressive. We did witness one or two jumping on people and zipping open their bags looking for food. They were cute but sooo spoiled. Monkeys are generally a nuisance here, playing overhead on tin roofs, stealing fruit off of trees and offerings from temples. Penjouri from a recent festival hang over the road, each one is handmade by the family from rice. Recap: This was a magical, welcoming and colorful island. It is also a well-oiled tourist machine and it's hard, though possible, to have an experience off of the beaten path. I'd recommend staying away from the heavily touristed areas of Ubud and the beaches. Ubud was so crowded that it was hard to walk on the narrow sidewalks with kids - scooters and cars roaring by. Strollers would be nearly impossible. We were there early in the season too, next time we will go during the rainy season, since I heard it only rains once, quickly, each day. When we were there outside the rainy season, it rained several hours almost every day - very unusual. While many Balinese speak English and are accommodating to tourists, you just feel like a number moving through. We did a lot of touristy things and if we went back I would seek a more authentic, relaxing experience outside the hustle and bustle. There is so much beauty here and the people are all very friendly and family-oriented. The food was fine, we never got sick, except Knox and I a bit of tummy-trouble towards the end, most likely due to some unwashed strawberries. Nothing serious. We ate out in town at some small-run cafes and it was delicious. Nasi Goreng (chicken and fried rice or noodles), Sate Lilit (skewered chicken with sauce), and lots of Balinese desserts made of coconut and brown sugar!! We drank and brushed our teeth with bottled water.